In 1988, a small group of service providers met to discuss the possibility of developing a means to get to know other providers who shared common interest in the older-adult population. 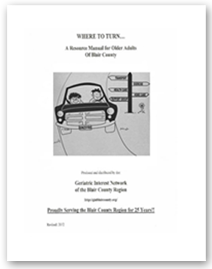 As a result of that meeting, the Geriatric Interest Network of the Blair County Region began. The first educational presentation was offered in March, 1989, and educational programs and networking events have continued since then. The original leadership group was expanded to represent the diverse network of providers which emerged. In 1990, reorganization included a new category for general membership. The first resource manual for older adults was prepared in 1992. Throughout 1994-1995 strategic planning was completed to prepare the Network for continued growth and development. Annual conferences for professional and informal caregivers were added to the Network’s offerings. GIN has served the Blair County region for more than two decades. The growth of the Network is directly related to the professional support and concern for older adults which has been demonstrated by our leaders and members. The Geriatric Interest Network of the Blair county Region stands as a tribute to the commitment of these community leaders.